I think many people love animals more than people. I mean, think about it -- they don't talk back, they're usually a blank canvas that gazes up at you, are really good listeners, don't care if you gain weight or lose your hair, and can only leave the house when you want them to. Those are the domesticated animals, but it sometimes translates to the wild animals, too. Like Tatiana. Maybe we see something in her that helps people tap into their wild nature, perhaps she reminds us of our tabby. Maybe she reminds us of us, only with more humanity. Look at the number of memorials she has on the Web, including this one at Yelp. Tatiana was like Rocky... people were always hating. And being a fighter at heart she took what was hers. -- Lee M.
There are like 6 billion people on the planet versus about 5000 tigers. 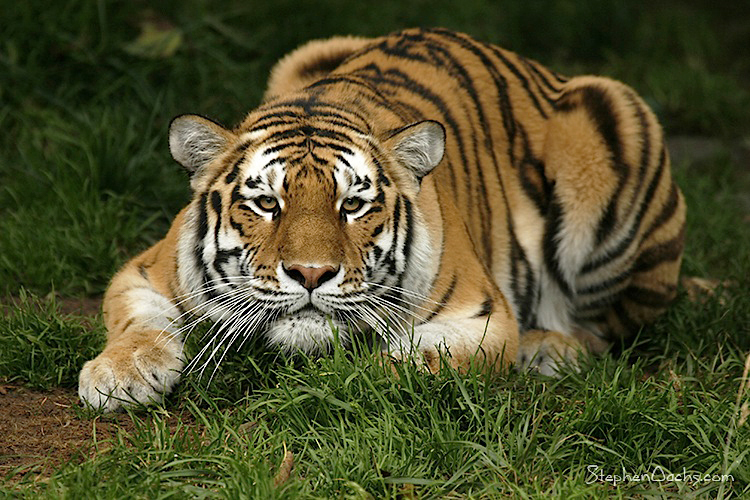 Unlike humans, tigers don't really kill things for no reason. -- Phillip W.
This just makes my heart ache. She is just so beautiful and deserved a much better life. RIP. Peace. Again, who speaks for Tatiana? Who will defend her side in a court of law? Who will show the judge, the jury, and the media what tigers are really like; the innocence of their joys in life and the ever-present danger they pose to us bipeds? Who will stand up for Tatiana and call what was done to her by its proper name. abuse? . . . Who will speak for Tatiana's warm place in the sun, and bring down the hammer on the bastards who stole it from her? I was devastated when I heard the tragic story of Tatiana. My heart aches for this beautiful tiger whose life was cut short in its prime. What a waste of beauty and grace! Rest in peace, Tatiana... May the angels be with you. We will stand for Tatiana. Will you join us? I hope that my previous comment went through. If not, I just want to confirm again that I will stand for Tatiana and I want to join you. A very sad situation. Such a magnificent animal that never had a chance in this human world. The zoo never kept her safe. They left an open loaded gun and those stoned idiots pulled the trigger. The result was it all fired on themselves and the tiger. The police officers probably couldn't do anything else. But again, the zoo should have a greater safety clampdown in place. I hope everyone realizes that the innocent party was Tatiana the Siberian Tiger. It is so ironic that the supposed safest place for an endangered animal is no longer in a captive environment. More safety zones in their native environments might be their last hope. If people have seen them in their natural habitats, they will understand better. They are simply magnificent. Many people in those places in Siberia and China are fully rotecting them and their environments. But then again, idiots and stoned brains will still try to pull that trigger won't they? Let's hope the tigers' safekeepers win their battle. I hope you will forward my comments to the friends of Tatiana.